Notes This level takes place in a damp cave. Treasure Caves is a course in the Sherbet Island area of Timber Island. It is featured in Diddy Kong Racing and its Nintendo DS remake, Diddy Kong Racing DS. The course can be driven in on all three vehicles: The car, the hovercraft, and the plane. Being one of the later tracks encountered, it requires sixteen Gold Balloons to enter, or 22 for the Silver Coin Challenge (or Balloon Touch Challenge in the remake). In Diddy Kong Racing DS, Treasure Caves features no major differences in appearance but differnet music is played during the races. 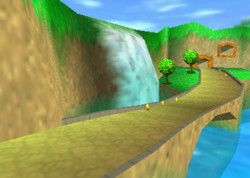 The track starts out on a wide bridge that curves around a waterfall, seen to the left of the road. A Zipper is placed on the right side of the road, and to the left of the large bridge are a few rock formations sticking out of the water. One of these rocks has a Power-Up Token on it, although it can be obtained by plane only. Another Power-Up Token is located in the air near the end of the bridge. A small tunnel is at the end of the bridge area of the track, and in it are three Weapon Balloons, two of which are red, and one that is blue. On the side of the wall near the tunnel's entrance is a separate tunnel leading to the next part of the course. It can be reached only by plane. On the other side of the tunnels, the road stretches under a large, bent rock connected to the wall. An area of water is to the right of this, and a few palm trees surround the edge of it. There is a Zipper past the giant rock tunnel, and it leads between a few red and green Item Balloons into a wide cave. A long passage stretches into this dark cave, which is filled with some sunken ships. A strange, green goo surrounds the dirt road in here, and a few Item Balloons float in the air for pilots. The green goo can be driven on in a hovercraft in order to reach a Power-Up Token near a ship. 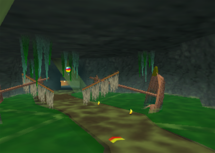 The cave soon narrows into a tunnel consisting of a Zipper and a lone Power-Up Token, along with some bananas around the bend. Outside this tunnel is the end of the bridge found at the beginning of the race. The path on the bridge is straight and leads directly to the finish line. Like the other levels of Diddy Kong Racing and Diddy Kong Racing DS, Treasure Caves is filled with eight Silver Coins, scattered all around the area. However, the coins only appear once the player has beaten the world's boss at least once. The first coin is located right next to the wall to the left of the starting line. Farther ahead of the first coin against the wall on the right is the next coin. The third coin is around some palm trees on the right side of the first hill, after the first tunnel. The fourth coin is near the lake on the right side of the road, shortly before the cave entrance. In the cave, the fifth coin can be found on the edge of the road. The sixth coin is immediately after the fifth coin on the left side of the road. As the racers enter to tunnel leading out of the large cave, they ride between the seventh and eighth coin. This page was last edited on January 31, 2019, at 23:36.